5… 4… 3… 2… 1… blast off to a universe of stories! Kick off Summer Reading in a big way! 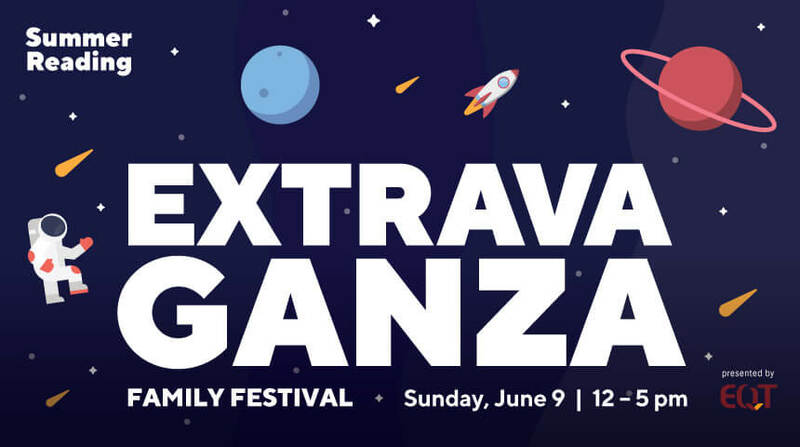 Join us on Sunday, June 9 at Carnegie Library of Pittsburgh’s annual Summer Reading Extravaganza, a family-friendly outdoor festival for all ages. Grab your friends and head to the Library in Oakland for music, crafts, games, activities, storytelling, food trucks and so much more. While you’re there, enroll in Summer Reading and get your 2019 materials and book lists. And don’t forget, use #PGHREADS to tell us what you’re reading this summer. Find a friendly challenger or come by to learn the basics. Then, make your own chess piece to start a personal set! Play and learn together with toys and activities for children ages birth to 5 years and their caregivers. Have your name written in a different language, learn about Library resources and Library Welcome Centers, make buttons, play games and win prizes! Explore technology and materials that make reading accessible to individuals with print disabilities. Use our computer and headphones to add an oral history to Yinzstory and learn more about how you can contribute. Stop by for rhythm games, thermin playing, electronic gadget playground and more! Love books? Come play reading games and fill out a top ten list of your favorite authors to help us make Pittsburgh’s Favorite Author Bracket. Create your own circuit vinyl stickers and planetary puzzles. Say hello to your CLP Board Members and play a game to win a prize! Share your library story at our selfie station and color a picture for our wall of fame. Browse our selection of new and gently used books (and some AV). There is something for everyone!